Introduction. Part I. Meteorology in 1900. An Empirical Tradition: Climatology. A Theoretical Tradition: Physics of the Atmosphere. A Practical Tradition: Weather Forecasting. Part II. Meteorology in the First Half ofthe 20th Century. Vilhelm Bjerkness Program to Unify Meteorology. Lewis Fry Richardson: The First Person to Compute the Weather. The Growth of Meteorology. Meteorological Calculation in the Interwar Period. The Effect of World War II on Meteorology. Part III. The Beginning of the Computer Era in Meteorology. John von Neumanns Meteorology Project. The Acceptance of Numerical Meteorology. The Unification of Meteorology. The Recognition of Limits to Weather Prediction. Endnotes. Notes on Sources. References. Index. During the course of this century, meteorology has become unified, physics-based, and highly computational. Calculating the Weather: Meteorology in the 20th Century explains this transformation by examining thevarious roles of computation throughout the history of meteorology, giving most attention to the period from World War I to the 1960s. The electronic digital computer, a product of World War II, led to great advances in empirical, theoretical, and practical meteorology. At the same time, the use of the computer led to the discovery of so-called"chaotic systems,"and to the recognition that there may well be fundamental limits to predicting the weather. One of the very few books covering 20th century meteorology, this text is an excellent supplement to any course in general meteorology, forecasting, or history of science. Meteorologists; atmospheric scientists; historians of science; earth scientists; and mathematicians working in the areas of computational math and math history. @qu:The book is well written and pleasant to read and includes about 450 references and a good index... Readers interested in the early history of numerical forecasting will find it a useful summary. @source:--NATURE @qu:There is an extensive set of notes that accompanies the chapters, references, and an extremely 'friendly index that unerringly points the reader to the correct page by subject and/or person. I was unable to find any typographical errors. I also compared quotations in the text with source material and found the author to be absolutely accurate in working and location. This accuracy and attention to detail breeds confidence in the material presented. Tracking quantitative meterology over the 100-year span (1850-1950) is admirably accomplished by Nebeker. I was especially pleased with his discussion of the early work in predictability that generously quotes from the research papers of George Platzman and Philip Thompson....Via the avenue of stimulation and through an abundance of historically accurate accounts, Nebeker has added an important contribution to the recent history of meterology. 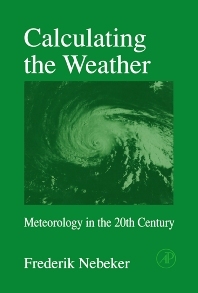 @source:--BULLETIN OF AMERICAN METEOROLOGICAL SOCIETY @qu:"This book surveys the progress of numerical methods in meteorology over the course of the 20th century. The author takes care to explain most tehcnical concepts...the book reads well and offers convincing suggestions of the ways in which institutional and military factors directed meteorology toward computional approaches. CALCULATING THE WEATHER is a welcome addition to a field still largely neglected by historians of science." @source:--Theodore S. Feldman, TECHNOLOGY AND CULTURE.